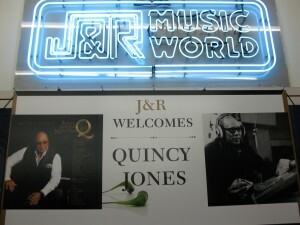 Anthony Martinez, 52 arrived at J&R Music World at 4pm to wait in line to meet the renowned producer Quincy Jones. This meet and greet session for fans was promoting Jones’s new book entitled “Q on Producing,” and his new CD, “Soul Bossa Nostra.” Martinez came to the store to get his copy of the new book autographed. Meeting a legend like Quincy Jones is a once in a lifetime event. At 77, Jones is still going strong collaborating with some of today’s hottest artist like Ludicris, Robin Thicke and Snoop Doggy Dogg on his new CD. Mr. Martinez is a musician himself. He plays the bass guitar. View the slide show to see pictures from the perspective of Anthony Martinez as he waits to meet a legend. This entry was posted in Photo Slideshows, Uncategorized and tagged J&R Music, music, producing, Quincy Jones. Bookmark the permalink.